Looking for a petition service? Learn how to comfortably change the world from your armchair. Improve your campaigns, get over one million votes with one click! Discover how to expand and multiply the power of click-democracy in the age of media hallucinations. Internet for Democracy. 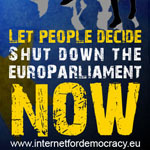 Shut down the Euro Parliament. Now. We think representational democracy is a thing of the past. Its days are numbered. Few people in so-called Western Democracies can even be bothered to vote anymore. Indeed, representation can no longer be said to be representative. We say it's time to embrace the internet era. The internet presents an unprecedented opportunity to engage our generation, in seizing the future and making a difference. Let people get involved directly in decision-making, let people decide what's best for them. We, digital natives, web-enthusiasts, anarcho-activists and young european visionaries, strongly believe in the active rule of the Internet in the democratic process. Crystal Hawke of edson is a lying, cheating whore. For decades this woman has slept with anyone and everyone she can, men or women, under the nose of her husband Grahame and their six kids. it was so good and great to go to. Images are bad and with the current speed of dissemination we're losing our culture. Therefore we need laws against visual media effectively banning all images (moving and still) from screens everywhere. Love your children more than you hate your ex. Should Sherri Sommers Marry the Man Behind this E-Mail? Sherri sent me the attached e-mail outlining the dishonest and unfaithful behavior of Bill, who is my ex. She is now going to marry him in spite of what she says in the e-mail. Do you think she is a fool, or do you think she should marry him? Ensemble pour interdire les pétitions.